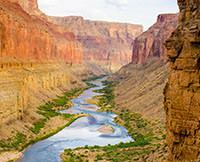 Adventure, Skilled and Humorous Guides, Great Food, Beautiful Locale in the Grand Canyon! Thanks to Wiley, Ronnie, Scott and Nick! From the helicopter ride into the Grand Canyon, to the delicious food, to the humor and expertise of our guides, this was the trip of a lifetime for me. All our kids and their partners were able to make it and experience the wonder of the Grand Canyon with my husband and me. It was enjoyable and I hope to be back one day!